I am a connectologist. Since 2002, I been studying and practicing the act of connectology which is the connecting of two or more people for the purpose of sharing ideas, information and resources to create WIN WIN outcomes. 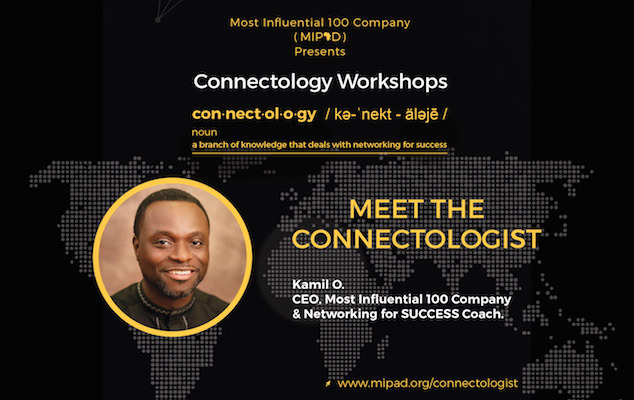 In English, many call this “networking for success” but at MIPAD, the World's #1 EXCELLENCE Network, we call this connectology! In doing what I do, I interact with some of the most influential and successful people in the world which means I see success in its many different forms and I can tell you for FREE you can't cut & paste it because it is different for everyone. This session is designed to support you define what success looks like for you and give tools on the art of networking to keep you on the path to living your dream life. Come let’s have talk about networking for success, your dream life and new possibilities in 2018 and beyond! And my God Kamil.....you are a Gift...and I mean it. I have met the so called international life coaches ....but you are unique! you will go so farrrrrr! I just love that I was part of #MyDreamLife Session....i extended my dream...this morning...hello someone...Wake me up!!! !